This may be an age of increasingly advanced technology, but most organisations still need to use postal and courier services to send and receive physical mail. As a result, there is still a risk of receiving something dangerous through the post. Mailstreams into and within an organisation present opportunities for malicious attacks, including hoaxes, and without the appropriate security measures this can affect an organisation’s day-to-day operations, as well as its reputation. 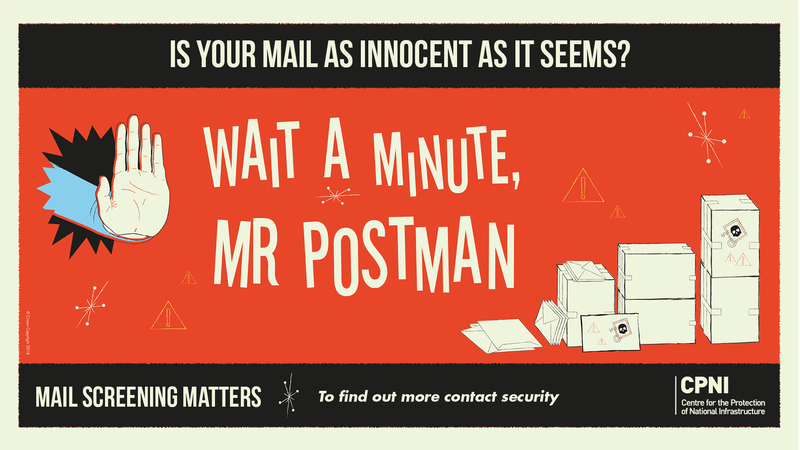 That’s why it’s important to understand how to minimise the risk and impact of suspicious mail. CPNI has developed a kit of engaging resources to make it easy to raise awareness around postal security. These resources complement the information within “PAS 97:2015 Mail Screening and Security – Specification”. PAS 97:2015 is CPNI’s comprehensive guidance on mail screening and security and is available from the BSI website. It is useful to those assessing the risks an organisation faces from postal threats, and implementing appropriate screening and security measures, either internally or outsourced. Some of the guidance materials are editable (using InDesign) to allow you to add your own organisation’s logo and include the most suitable contact details. These files can be found in the guidance section at the bottom of this page. Please ensure that you have the appropriate software installed in order to access the InDesign files. You may find CPNI’s 5Es framework useful for planning and maximising the impact of your in-house behaviour change campaigns. A poster summarising the key suspicious indicators to look for and a factsheet (in print and digital formats) presenting more detail. 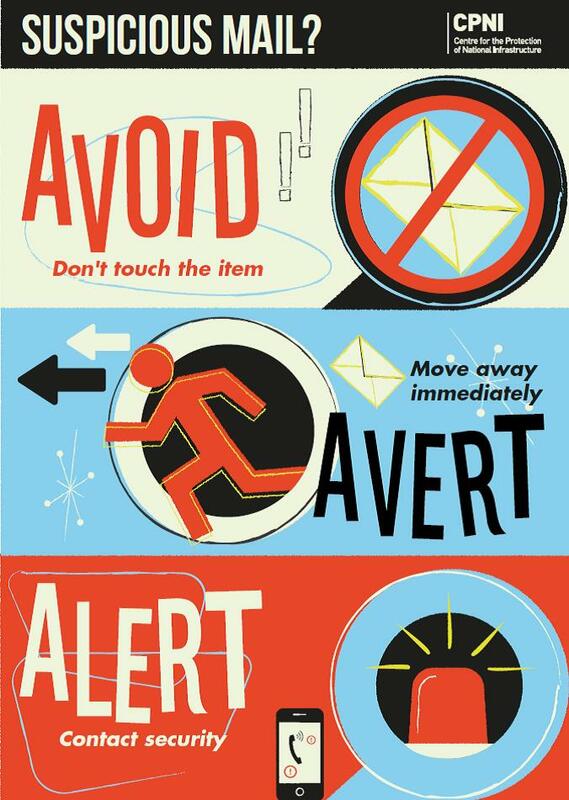 A poster summarising the key actions to take on finding a suspicious mail item and a factsheet giving more detailed response guidance. An introductory guide for organisations to outline the threat and provide further information on how to make optimal use of the guidance materials. An example launch email that can be personalised and sent out to teams or business groups to introduce the campaign. Two editable PowerPoint presentations; one to brief all staff* on mail screening and security, and a second for mail handlers* on suspicious indicators and response actions. A PowerPoint presentation* and two factsheets summarising the process to follow when designing mail screening procedures, and how to assess the risks to your organisation. A tool to help identify the appropriate screening level for each mail stream within an organisation. This is available in print and digital formats. * For full usablilty please right click and 'Save' these PowerPoint files.